Marvel Studios’ new superhero movie Guardians of the Galaxy is a smart, funny, self-aware bubblegum movie, like the recent X-Men film Days of Future Past, it features a retro playlist indicating an increasing possibility that middle youth, as well as actual youth, is an important target audience. Guardians of the Galaxy is a Marvel Comics-based sci-fi action adventure about a group of misfit outlaws who band together to defend the universe against a murderous villain.In many respects, “Guardians,” directed and co-written by indie wit James Gunn, and starring buffed-up former schlub Chris Pratt and Really Big Sci-Fi Blockbuster vet Zoe Saldana (here dyed green as opposed to her “Avatar” blue), is a fun and relatively fresh space Western. Think “Firefly” pitched at 15-year-olds, with a lot of overt “Star Wars” nods. And super-“irreverent” dialogue that is, more often than not, genuinely funny. The wisecracking by the characters played by Pratt (a kind of junior Han Solo) and voiced by Bradley Cooper (whose Rocket Raccoon, who is, yes, a genetically altered raccoon) is so incessant viewers of a certain age might wonder whether this movie has been put through the “What’s Up Tiger Lily” dialogue-replacement treatment before release. Pratt’s self-styled “Starlord” and Rocket are not the strangest of the initially inadvertent teammates in this intergalactic posse. 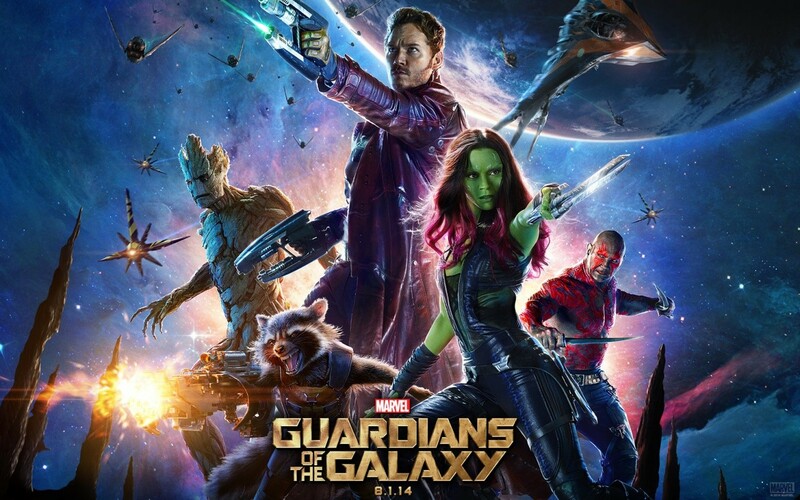 Saldana’s Gamora is a stealthy warrior princess who’s been lying low in an evil family before revealing her good intentions; wrestling star Dave Bautista’s Drax is a vengeance-driven behemoth whose florid language only briefly masks his inability to take anything other than literally; and Rocket’s “muscle,” Groot, is a walking, minimally talking tree. These guys are entertainingly motley, which makes the fact that their mission, to save the universe from a mass-murdering megalomaniac who seeks an item which will grant him unimaginable mass-murdering power (yes, more mass-murdering power than he ever had before), is generic in a way that’s pretty consistent with movies of this sort.